Sent the novel “Beneath” off to my friend Kate Harrison at Dial today. Can’t quite describe how that felt. And of course I realize that a novel is never final until it’s in the stores, but I think it’s a pretty good yarn and I trust Kate to make it better. You’ll be able to read it for yourself this time next spring. To celebrate I took the afternoon off. Went over to the Casa, which is coming along fine, which is good because we are giving up our two week renting life and moving back “home” on Sunday. 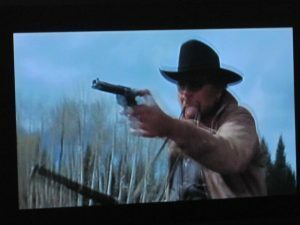 Then I went really crazy and watched “True Grit” on television, which is one of my all-time favorite westerns. Vacation’s over tomorrow morning. I’ll be up early tomorrow morning and start back in on “I,Q Book Two: The White House.” I’ll probably never be totally caught up, but I’ve managed to loosen a couple of logs the past few days and the river’s starting to flow again.